my normal scanner broke and I didn’t want to delay this post any further. 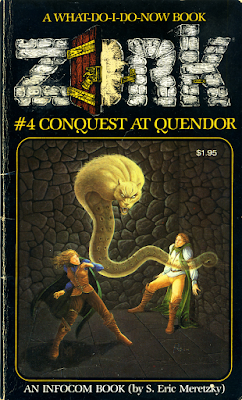 After three books in 1983, only a single concluding title was released in the Zork “What-Do-I-Do-Now” now series: Conquest at Quendor. Like the previous books in the series, this one was written by Steve Meretzky as a promotional tie-in to the Zork series. While reading is fundamental, so is marketing computer games to children. The first several books established a pair of protagonist siblings, June and Bill, who through various magical means travel to the “Kingdom of Zork”. 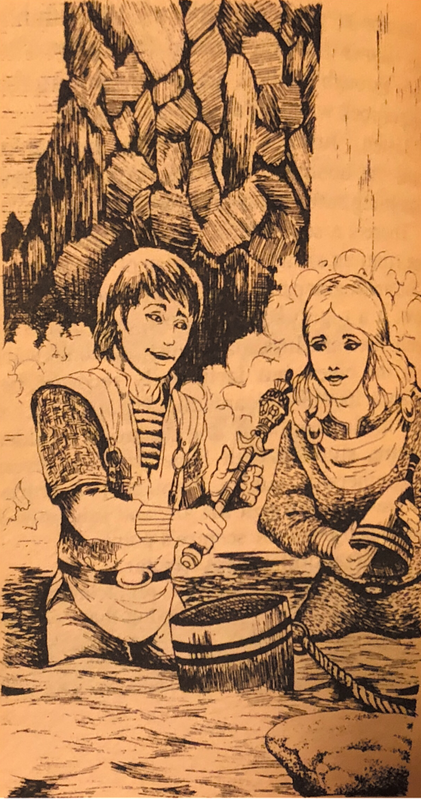 Once there, they are transformed into Juranda and Biovtar, long-lost royalty from the kingdom, and go on adventures to save the king, defeat a demon or two, and wander through puzzles and situations taken directly from the Zork and Enchanter games. The first three books were surprisingly competent for a busy first-time author, although at this point it wouldn’t surprise me if Mr. Meretzky could do just about anything. 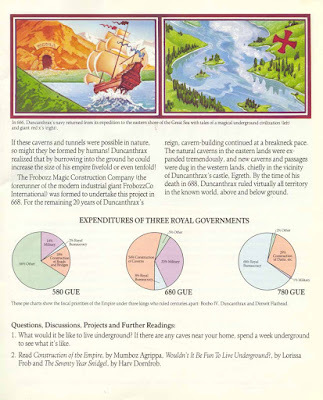 If you are new to game books or want a refresher on the game book industry in the 1980s, please check out my post on the first three books of the series. As with the third book in this series, interior illustrations were provided by Dell Harris. Mr. Harris is a legend among genre illustrators and often sells his art at conventions. His Facebook page (Atomic Dog Studio) hasn’t been updated in some time and he may have retired from the industry. The cover was illustrated by “Parks”, just like the first and third books of the series, but I have come no closer to figuring out who he or she was. As before, I have included some sample illustrations from the book, but I will try not to over-do it. 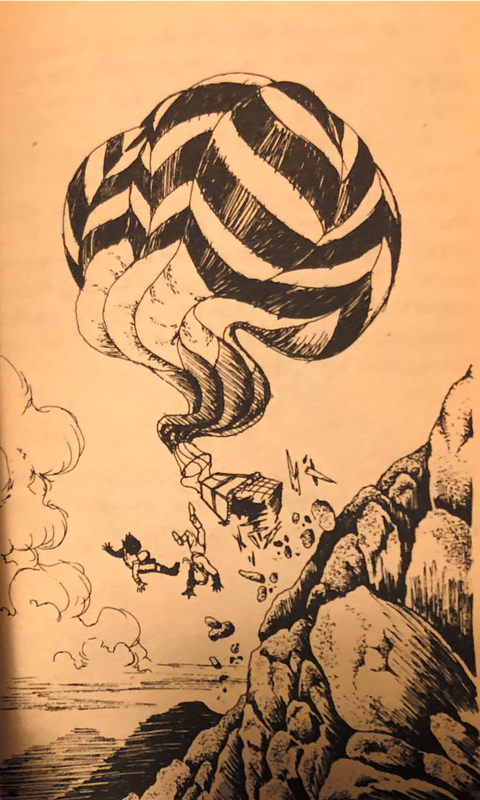 These remain some of the first illustrations of Zork items and locations and for that reason alone they are important to our marathon. Our story begins one beautiful summer’s day as June and Bill are playing baseball. Without warning, they are plucked from this world by a giant floating hand and returned to the world of Zork. Instead of arriving back at their uncle’s castle, they are trapped in a dungeon with seemingly no way to escape. 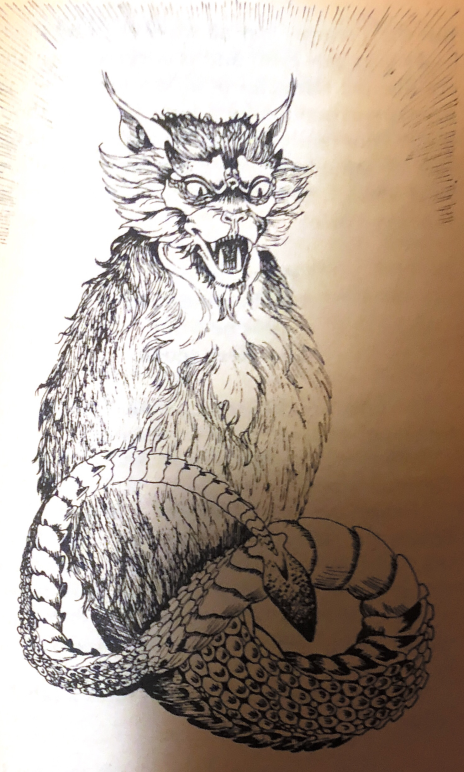 Now transformed into their Zorkian identities of Juranda and Biovtar, the opening of the book sees them trying unsuccessfully to escape while being taunted by a cat-snake creature with a penchant for rhyming riddles. Ultimately, they have to be rescued by Fred and Max, elves that they saved in the second book, as well as their “uncle” Syovar. The villain that captured them was Grawl, the sorcerer from the previous book, but he’s just the lackey for a far more serious threat: the demon Jeearr. Whether this is before or after we defeated him in Sorcerer, I’m not sure. Syovar is struck down defeating Grawl and we all flee back to the Castle of Zork. From here, the real plot of the book opens up: Syovar had been about to negotiate a treaty to unite all the warring kingdoms of Quendor. Jeearr apparently doesn’t like that and wants to arrange some sort of permanent Zexit. But now that Syovar is out of commission, it will be up to his son, Logrumethar, to negotiate the deal… only his son doesn’t have the cachet his father had with the other nobles. What’s a diplomat to do? Lie. If we can help him to locate the “Helm of Zork”, he can magically impersonate his father and conclude the peace treaty. Since we had rescued Logrumethar in the third book, naturally we’re called on to track down the artefact and ensure the peace conference goes as planned. With a familiar scepter hidden in a buoy! Since this is a “choose your own adventure”-style of book, I won’t try to summarize the rest in any detail. 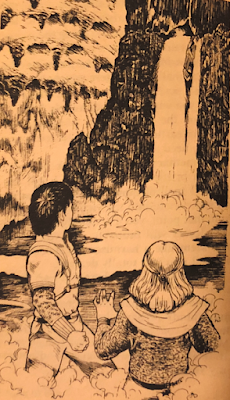 Bill and June are transported near the location of the Helm using the same spell that we used in Sorcerer to find Jeearr. By an extreme coincidence, this is the location of the first three Zork games! 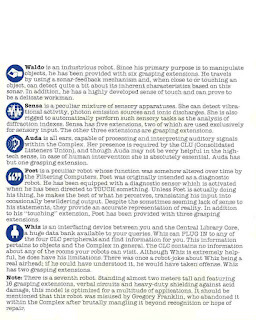 That gives us yet another opportunity to navigate puzzles from the game in convenient book format. We revisit the Aragain Falls and use the rainbow scepter (found in the buoy, as in Zork I) to make a bridge across. Further in, we find the artist’s studio, the loud room, and even give a snack to Cerberus. 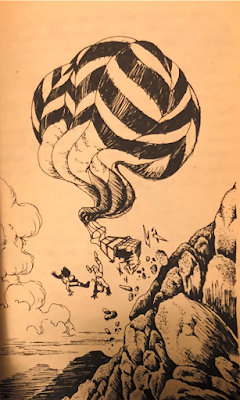 We have to escape the volcano in a hot air balloon (from Zork II), and eventually ride the strange trolley-rooms (from Zork III). Riding in a hot air balloon is fun! But remember to land before you go too far. Somehow all of this leads to the ruined castle from Sorcerer where we discover the Helm. But at what cost? None at all! We don’t even defeat Jeearr, merely run away magically and let some later Enchanter (*cough*) do the deed. Logrumethar’s peace conference is a success and Syovar survived his injuries. 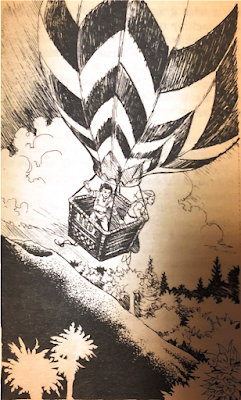 Bill and June are returned to Earth to complete their game of baseball, presumably never to return to the (now peaceful) magical land of Zork ever again. We have a peace treaty! Although not perfect, this book was a good capstone on the series. We had recurring appearances from Fred and Max, not to mention Gral and Logrumethar. The Treaty of Quendor effectively closes an era of “Zork” history so this is as good a place to end the series as any. I am still confused how any of this fits into the continuity of the games, but these are fun side stories intended to sell more copies of computer games. How much continuity should I want? That said, this feels like the weakest book of the four. It is more linear with a large portion of the choices just leading to deaths. Jeearr doesn’t come off as powerful or evil, more like a Zork version of the Riddler. The fact that he ripped us from our Earth against our wishes to drop us into a Zorkian prison should be scary… but it’s never played that way. The various Zork puzzles are not well integrated into the story although it’s always fun pointing out the “famous” locations that our protagonists are visiting. I might have wished for a stronger end to the series, but all in all they weren’t a complete waste of time. These are the last Infocom books with branching paths. I’ll cover the next ones, novelizations of Planetfall and Wishbringer, when we get to 1988. The old “box” left, with the new standard box on the right. Infocom was no longer a young company. With more than five years in operation and more than a dozen games under their belt, a certain “corporatization” started to set in. The culture of the company was changing and this is evident not only because they bought new office space and was about to launch their first “business” product, but in the way they sold and marketed their games. 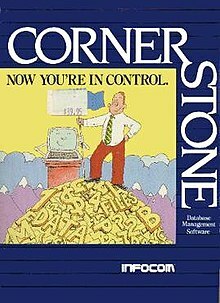 We’ll talk more about Cornerstone and its impact in a week or so, but a certain uniformity was creeping in to the way that Infocom did business. For our purposes, this was manifested in two important ways: the manuals and the packaging. Let’s hit the latter first. 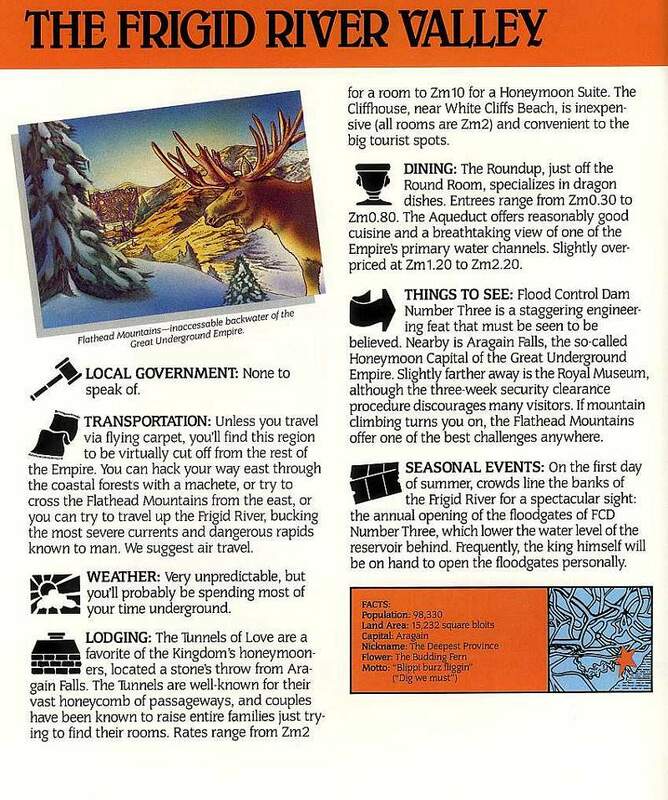 You can divide Infocom into roughly three eras when it comes to their game packaging: the earliest days of Zork I through III, the “folio” era which ran from Deadline to Seastalker, and the “grey box” era which survived nearly to the end of the company. The earliest packages reflected a business that was just amazed they were shipping a product with minimalist manuals in blister packs. Starting with Deadline, Infocom developed its own sense of style. Each game would get an integrated manual and many extras (often called “feelies”) that were tailored to each game. 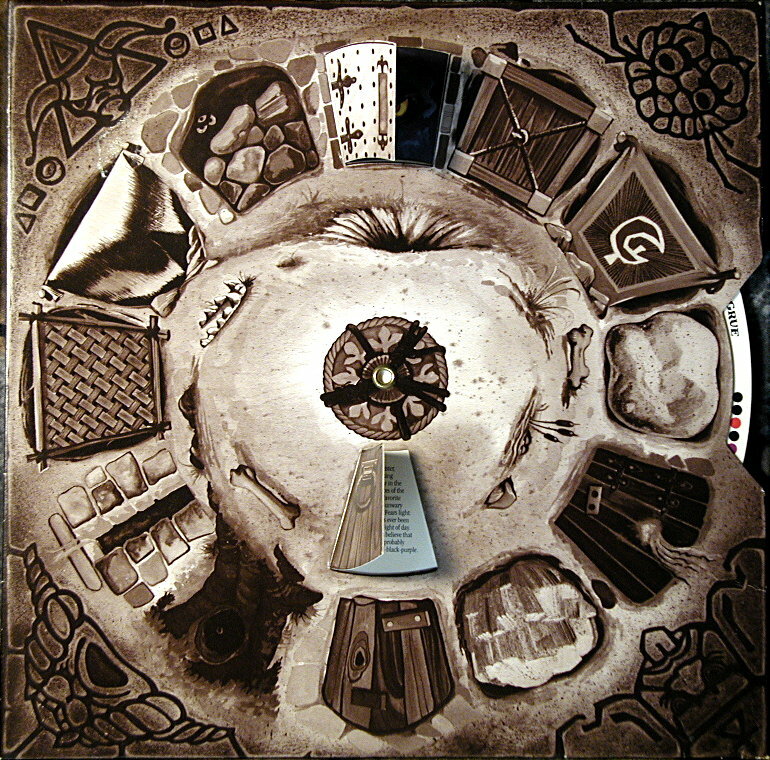 Deadline had police reports and evidence folders, Suspended had a whole fold-out game board and pieces, and Sorcerer had a spinning wheel of copy protection. 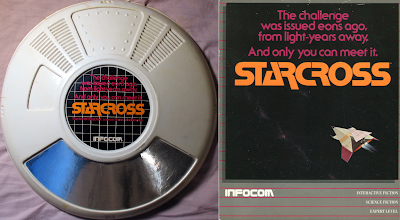 Even the packages were unique such as the circular “box” for Starcross and the creepy mask for Suspended. Enchanter and Sorcerer both had extra-large boxes. Deadline and Suspect used police folders. Even if you just tore the thing open, you had to admit that they were individualized experiences. Starting with Cutthroats, that all changed. Now all Infocom packaging would have a common look and feel, including a common size. Infocom games looked good together grouped on a shelf because they were designed to belong together. The grey and red stripes stood out, even if the packaging itself didn’t. It wasn’t just the outside of the package that changed, now each game would have a standardized manual. This applied to all of the old games as well; each of them would be re-released starting in 1984 under the new package designs. This meant that-- for better or worse-- completely custom manuals (such as for Enchanter) would have to go in favor of standardized formats that would be more accessible to new players. To steal an expression from George Lucas, all Infocom games would rhyme. The brightest spot in the re-releasing of all of the old games is that the original Zork trilogy could finally get the extras and “feelies” that they missed out on because they were released too early. For many of us, myself included, these are the versions that I have fond memories of exploring when I was younger. The actual games did not change, but the extras helped to make them feel more like part of a living world. The centerpiece for Zork I was a new mini-book, “The Great Underground Empire: A History” which is included in the package. 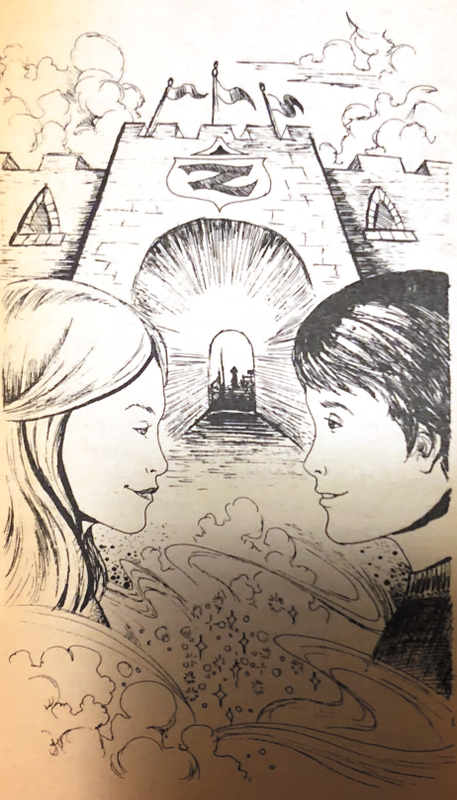 Done in the style of a children’s history, the book represents an astounding level of detail in characters and dates that fits with what we learned across all three Zork games. I’d be willing to wager that Steve Meretzky was responsible for this as he is infamous for being the guy that tried to tie all of their early games together. I don’t have any proof, but if anyone had made note of the different time machine settings from Zork III for example, to make the book line up with them, it would have been him. 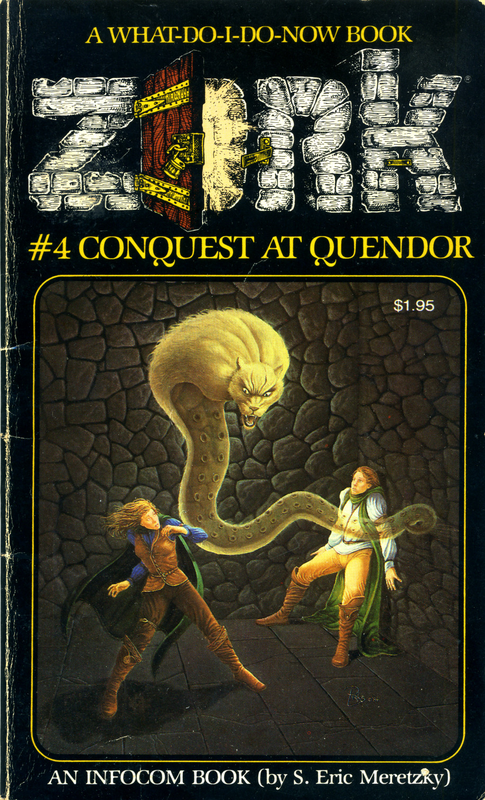 The text first follows King Duncanthrax as he conquered the known world, uniting all of the kingdoms of Quendor. With no one else to conquer, he sailed an armada across the Great Sea to discover an eastern realm full of magic and monsters and underground caverns. After conquering this new realm, he brought cavern-building back to the western lands and moved his kingdom partly underground. The book then jumps ahead to his descendant Lord Dimwit Flathead the Excessive who would begin the slow collapse of the empire. Dimwit renamed the kingdom of Quendor as “The Great Underground Empire” and built some of the locations that we visited such as Flood Control Dam #3 (Zork I) and the Royal Museum (Zork III). Dimwit wasn’t responsible for the end of the Empire-- that would come a few generations later-- but he more than started the ball rolling with his 98% taxes and giant building projects such as an island shaped like his head in the middle of the ocean. The opening of the “book”, as well as the books in the later two Zork games, has a library card which says that the book was last checked out of the Festeron Town Library in 948. (Remember that name! It will be back in a few weeks!) 948 is the “current date” when all of the Zork games take place (as revealed in Zork III) and I’m just very impressed how well everything fits. Zork II’s new extras included two travel brochures, one for an amusement park called “Bozbarland” and one for a ski resort called “Grayslopes”. 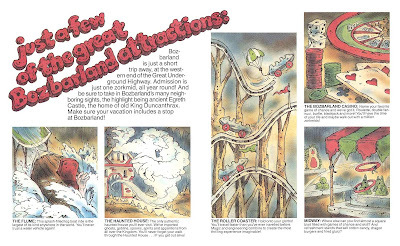 I have no idea why either of these were included, although Bozbarland was the amusement park that we visited in Sorcerer and this further ties the games together. 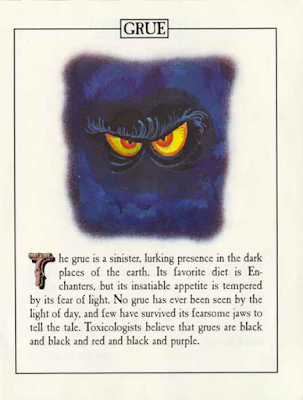 The book included with Zork II is “G.U.E. on Nine Zorkmids a Day”, a travel book. It describes the geography of the world and provides basic information on five different regions: the islands of Antharia, Greater Borphee, the Frigid River Valley, Gurth and Mithicus, and the Gray Mountains. Of those, only the “Frigid River Valley” seems important to the games, but the clue it provides about what to do with the Flood Control Dam #3 would have been more useful in the previous game than this one. I vaguely remember that Borphee appears in a later game, but I do not recall which one. Essential clues to a sequence three sequels later! We needed a big “You Are Here” sticker. Zork III’s extras seem even more “odd”: a current stock certificate for FrobozzCo, revealing that the company is still going strong after the collapse of the empire, as well as an ancient annual report from the year 778. 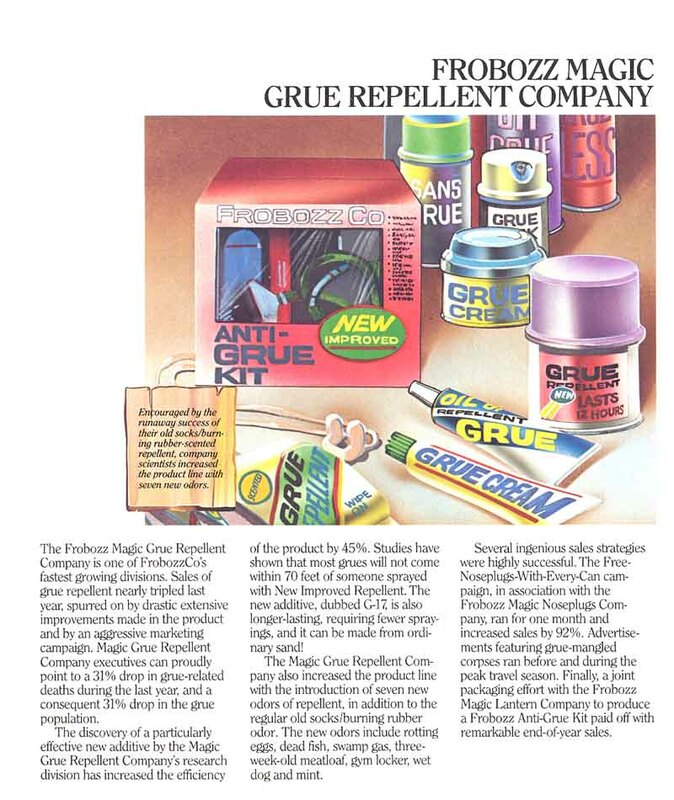 The report details a few of the thousands of component companies of FrobozzCo, but only one that seems pertinent to the game: the Magic Grue Repellent Company. Otherwise, there is some halfway decent worldbuilding with the description of the “Magic Cave Company”, the organization responsible for all of the tunnels that we have been exploring for the last three games. Of course, all of these documents tie directly into the ending of Zork III, but I’ll leave it vague if you happened to not have read my review to completion yet. Look! A clue to the game we are actually playing! Unlike Zork, Enchanter and Sorcerer already shipped with a full complement of extras. Even so, they were both updated for their respective re-releases… and not for the better. 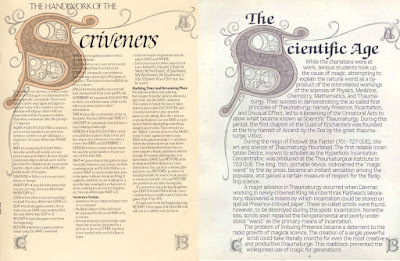 Back in my review of Enchanter, I gushed about how beautiful the manual was. It is fantastic, one of my all-time favorites. It effectively integrated the instructions for how to play the game with in-universe explanations, surrounded by beautiful calligraphy and illustrations. Its replacement was a mini-book entitied, “A Brief History of Magic” very much in the vein of the Zork re-releases. 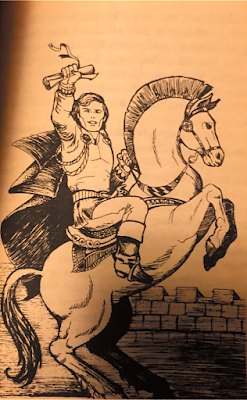 It contains some interesting in-universe history of the discovery and practice of magic, but other than color it doesn’t seem to offer many clues for the player. Original manual left, new one on right. 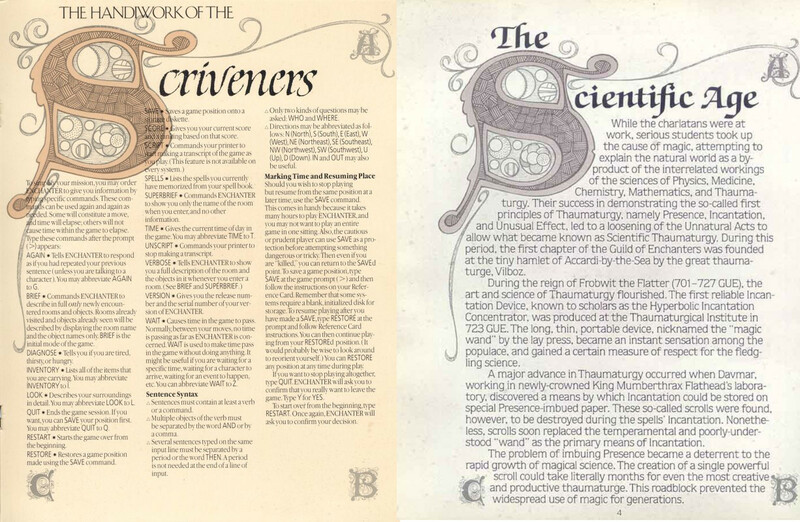 At least someone at Infocom liked the art of the Enchanter manual because they did manage to keep much of it. The head-letters and interior illustrations were all transposed from that version of the manual to this one. They were careful to make sure that the first letters of all of the sections aligned! I cannot get excited at all by this update. 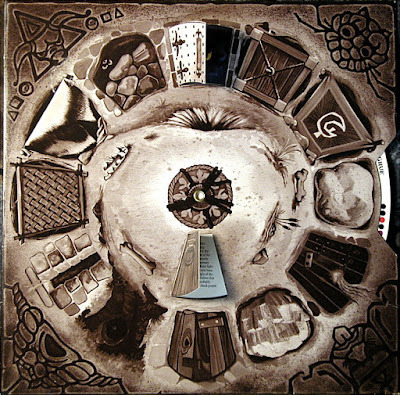 While the new version integrates the game fully into the legends and history of the previous three Zork titles (a strange omission I noticed while I was playing the game), it does so by sacrificing the game’s unique identity and a major part of its charm. It’s serviceable and not a bad manual on its own, but it’s hard to replace something “awesome” with something “good” and not feel let down. I am no less disappointed by the changes to Sorcerer. The hallmark of the original release was the circular “Infotater”, a device that you could use to learn about the magical creatures you were likely to encounter, as well as how to deal with some copy protection. 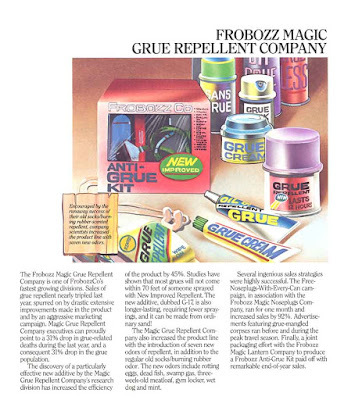 As there was no longer room in the box (or the spinning circle was too expensive to produce), it was replaced by the “Field Guide to the Creatures of Frobozz”, a mini-guide that contained all the same information, but was much less cool. Curiously, Infocom did not update the game itself so you still carry around your “Infotator”, even as it’s no longer in the box. On the bright side, the rest of the documentation and extras survived intact. The new version is at least easier to read. 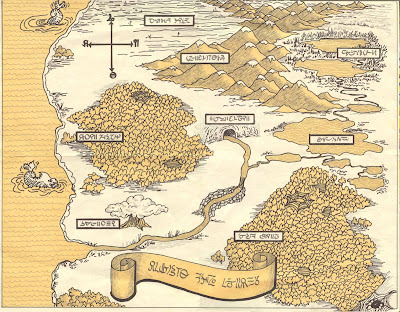 Outside of the Zork series, other games and manuals received small and large changes. I won’t go through them all individually, but there were only two games that had changes significant enough that they would have changed the way I felt about playing them. The first of these is Starcross. For all that I hate that Infocom removed the artistry from Enchanter, they still had some beauty in them when they put together the “Log of the M.C.S. Starcross”. This journal, covering your early adventures as miner-pilot of the Starcross, is wonderfully laid out and illustrated with full-color representations of the planets. More usefully, there is also a guide for first contacts with alien species included in the box; that is extra helpful because we’d be about to have several of those and interactions with the “natives” made up an essential part of that game. I can’t say enough how much I loved this update. The second of these is Suspended. I didn’t like this game much when I played it, but part of what made it extra difficult for me was realizing that there was a seventh robot and what I could do with it. 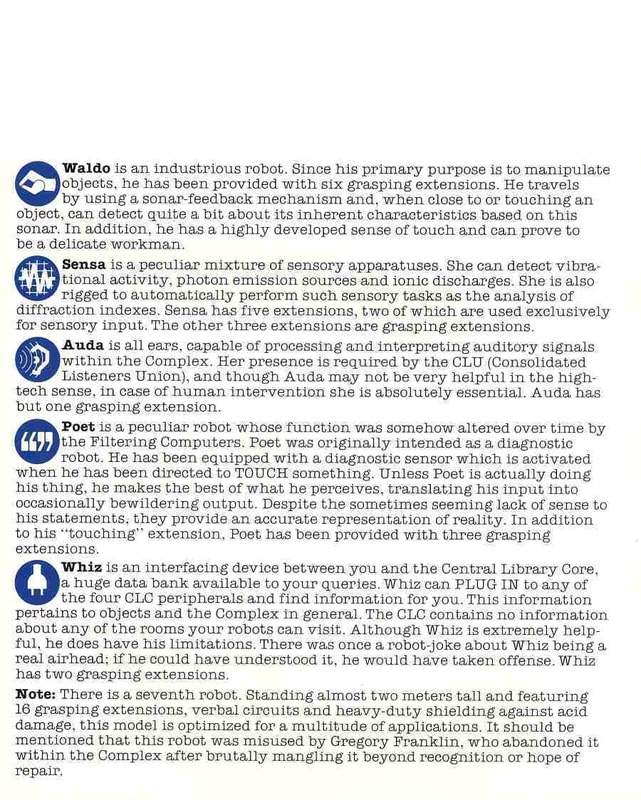 The updated package included a “Briefing for the Contra Center Mentality” which did a much better job of introducing us into the game’s world and to each of the robots that we would soon come to control. I don’t miss this game much, but I loved interacting with the robots. Now you’re playing with numbers! Of these only Wishbringer and Spellbreaker are “Zork” games, although I am looking forward to anything by Steve Meretzky. He has been my favorite author to date. Other than Spellbreaker, which I started many years ago and found to be too difficult, I know nothing about any of these. I think Ballyhoo is a mystery, but what connection (if any) it has to the Deadline games, I have no idea. I deliberately avoided Leather Goddesses when TBD was playing and I vaguely remember that Moonmist was one of the few games to receive a graphical update in Japan. I hope that means that it’s a diamond-in-the-rough that I just haven’t heard of yet. 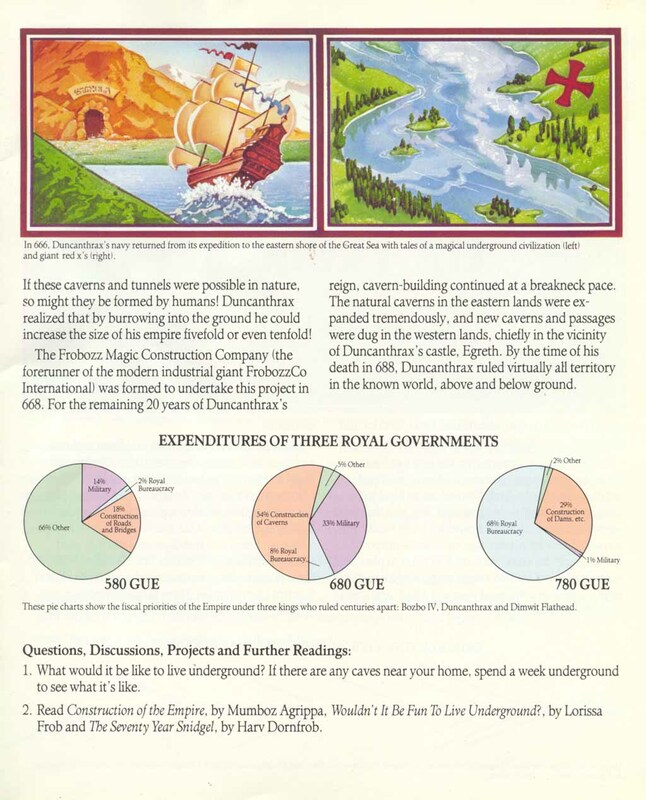 We’ll also be hitting Fooblitzky, Mike Berlyn’s final game for Infocom, although it is more of a family-style board game than an adventure. I’ll figure out how we cover it when we get there. Before we get there, we have one more side-trip: Cornerstone, the release that broke Infocom. More on that in a week or so. Don’t forget to check out my bonus review of Suspect and our GoFundMe page for The Christmas Adventure. See you soon! "That said, this feels like the weakest book of the four. It is more linear with a large portion of the choices just leading to deaths." My memories of the books (which seem born out by the diagrams posted at https://gamebooks.org/Series/311 ) is that "one true path"ism is a hallmark of the entire series, and I don't think that this book has really got any more of that going on than any of the prior books. It may be either that I didn't notice as much in the earlier books or my memory has faded in the last year. Either way, I don't think I liked the final one quite as much as the earlier ones. Congratulations for another Infocom year! 1985 should be a breeze, since they made only three games, and two of them are relatively easy to complete (then again, Spellbreaker will probably require a lot of effort). It is more linear with a large portion of the choices just leading to deaths. Something that's often true of the Zork games themselves. Zork III (and the Dungeon endgame) both had these rooms that you could turn or move them forward or backwards if you pressed on certain places. They were placed on a recessed track in the floor. While in Zork III, you could bypass the puzzle by becoming invisible, in Dungeon you had to ride the "trolley" to get past a hallway full of dangerous statues. Oh, I never thought of the mirror box puzzle as being a "trolley". To me that's either a wheeled cart of some type or a streetcar (or maybe a mining cart). I'm not entirely sure what mechanics the player is supposed to picture, but I always thought of it as just sliding along the floor. When I was growing up, we had these ancient, slow, rickety trolleys that shared our "subway" system. Somehow, the Zork III puzzle always reminded me of those. No idea why. Maybe because the contraption is described as wobbling if you push it without lowering the stabilizing rod? Excellent wrap-up, and here's to yet more installments of the increasingly misnamed Zork marathon! Of those coming up, I've never played A Mind Forever Voyaging, Leather Goddesses of Phobos, or Moonmist. I may play along with Moonmist if time permits. I absolutely concur that Spellbreaker is quite hard. In my opinion, the hardest of the entire Infocom line-up. I like that the Internet Archive will get "A Christmas Adventure", so I've chipped in. With a couple more kind souls who have more disposable income than common sense, we'll get this bit of culture duly preserved. It is with some amount of sorrow that I need to report that Stu Galley passed away in August. I had no idea. His family has asked for donations in his name to the Mass Audubon society and I have placed a donation already. He lived only a town over from me and I had hoped to interview him once we finished with Moonmist. It's a sad day.